The Gibson Centre offers a unique and historic venue for your special day. Our facility can accommodate all of your celebration needs from an intimate rehearsal dinner or bridal shower to rooms that can seat up to 150 guests for your ceremony and reception. The Gibson Centre welcomes weddings of any size, at any time of day. The Gibson Centre also provides Brides and Grooms with two suites to prepare and dress, while offering space for cocktail receptions and photographs. At the Gibson Centre, your wedding day is only yours. Our facility is committed to host only one wedding per day, which ensures that each and every Bride, Groom, family member and friend are given the very best of the hospitality that The Gibson Centre has to offer. Our facility can accommodate your ceremony, cocktail reception and dinner. There is no need to leave the building from the time you get dressed in our bridal suite to the time say your final goodbyes to your guests. 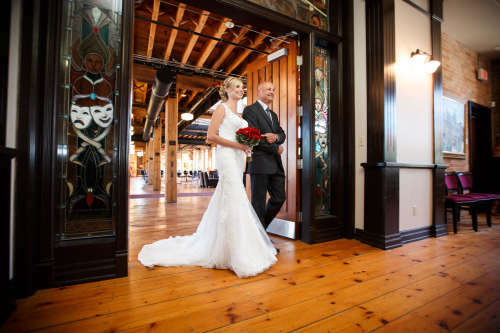 Our open brick and wood flooring give a wonderful back drop for photography and our brides and grooms have access to all floors of the building for their photographers to capture their day. Please contact us at 705-435-2828 for pricing and information and to set up a tour of the facility. Please feel free to click on the images below to see some weddings that have taken place at the Gibson Centre!